When you go to Walt Disney World often, people start to ask for tips, and I always have a hard time picking which ones to share. But before I head out on my next trip, I want to share a few of my favorite tips that have to do with what I'm packing. About a month before I head to Walt Disney World, I start gathering items that are WDW specific. Let's check out what a few of my favorite things are! about a month before the trip. 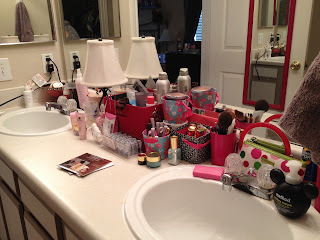 How many of you are used to sharing a fairly small bathroom area with multiple people? I know I go from the photo on the left to one sink and about a third of the space that I'm used to and I have to share that space with a man (or kids when I'm with my family) that I don't normally share a space with. I've found a few items that make this experience absolutely pain free! Usually "Buy 2, Get 1"
Yankee Candle Travel Room Freshener: Maybe I'm the only person who worries about this, but bathroom smells embarrass me, and when I was faced with traveling with a non-family member, I got crazy concerned about this issue. Yes, poop happens, but I like to pretend it doesn't, ok? In my quest for non-aerosol sprays (didn't want one to explode in my bag), I found these little bottles of awesome at my local Yankee Candle before my last trip. They pack a big scent in a tiny bottle. Last trip I put one in the bathroom withou Kyle realizing it, and he came out with one in his hand with a confused look on his face. Hehee. No, it's not a new Mousekeeping perk, but it will always be in the bathroom when he travels with me. This year I found Christmas scents. Now I know "Christmas Cookies" is an odd scent for the bathroom, but that's ok! 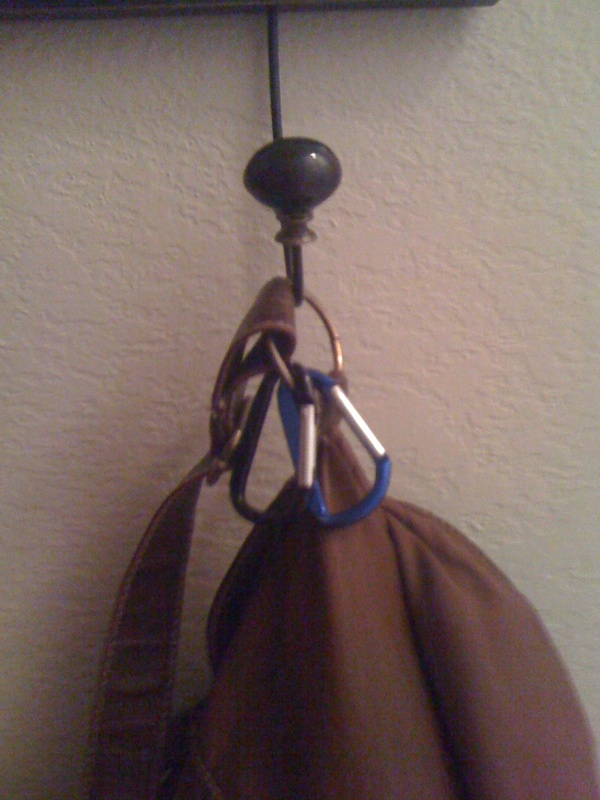 Cord Organizer: Wherever I travel, I typically carry my iPad, iPhone, digital camera, digital video camera, Nintendo 3DS (as of recently), an extra phone battery charger, and a small tripod. As you can imagine, that's a LOT of cords to keep up with and that can be easily misplaced or left behind. Since I'm all about cute containers, I found this purse in my closet, and it's now become my cord organizer both at home and while I travel. but just big enough for all my cords: it's perfect! Shoe Organizer: While I'm not bringing one this trip, families can benefit from an over-the-door shoe organizer. My sister always gets one at the Dollar Store before our trips and puts one in her bathroom at WDW to keep everyone's bathroom accessories separate. All those little pockets get filled with ponytail holders, hair bows, shampoos, conditioners, extra soaps, etc while keeping counter space clear for larger items. Carabiners: I've written an entire blog post about these little wonders! I love clipping a couple on my purse to help me carry small bags of souvenirs around with me. New Crocs: Over the years I've discovered that nothing feels better on my feet than Crocs. I have high arches, and even good sneakers cause my feet to ache and swell after a day in the parks. My first two trips as an adult, I ended up buying an expensive pair of Mickey Crocs in the parks. While I loved those shoes, they were clunky, and I could get them at the Outlets back home for much cheaper. My pair for this trip (and my last) are less Croc-looking which appeals to my fashion sense. These are the only shoes that I've worn that I can put on new, walk for miles and miles, and not worry about breaking them in. Those are my favorite things. What items are in your Walt Disney World bag of tricks when you pack? Have I forgotten any tried and true Disney essentials? Yep - air fresheners are a must. Especially when travelling with 3 boys. One thing I recommend to anyone visiting a theme park or doing tons of walking on a sight-seeing vacation is to wear sock liners under their regular socks inside their most comfy, supportive shoes. Saved my family from blisters more than once! These can be purchased from sporting goods stores, on-line, Land's End, etc. Also, I highly recommend replacing some of your regular personal hygiene products with travel size or alternative products to save packing space. Olay facial cleansing cloths is a great example. Removes make-up and dirt and lies flat in your bag, as opposed to jars and bottles. And even two travel size tubes of toothpaste are smaller than one regular size tube. And yes, Febreeze is a MUST for all kinds of smells! First off - hurrah for seeing comments from 2Dye4. Not only is she witty. Not only is she a snappy dresser. But she has a name like R2D2. (who of course was the real hero in all the movies, but that's a different topic) Lt. Dan taught us all to always change our socks. Goddessofmath - of course you like travel sized products. Their hobbit sized. You can get them at the same time you get your very small pants. Also don't forget the hard case for granola bars. Keeps your tasty snack from getting too crushed in the backpack, so you'll stay alive another day. Unless you're a dog and you brought oatmeal rasin flavored granola bars. Of course if you're a dog packing for a WDW trip you have bigger problems, like that whole operating zippers without thumbs thing or WDW's continued bias against quadrupeds. KeeperofBooks34 - My pants are short, not small, but I'm always happy to hear you call them small. :) The case for granola bars is a good tip! I'd forgotten all about it. Your oatmeal raisin comment made me snort Dr. Pepper up my nose, so there you go, now you've gotten both sisters. I bet my dog could figure out how to operate a zipper if he were allowed to attend WDW... he's smart like that. I mean, he's got more of a mastery of the English language than I do! If dogs were in charge, suitcases would just use velcro. And they'd smell like bacon. What great tips! Should I admit that we're 2 months from travel and I've had one of our suitcases packed for a month now?! LOL Yes, I'm sick! Unknown - 10 is my starting point. I trade around a lot each day in basically every place I go to, so those 10 traders can lead to 20-30 trades. I also plan on buying some of the new series, so I'll have about 15 new VM when I return. I just started collecting in November 2010. :) How many do you take to trade on a trip? Wow, thanks KeeperOfBooks34 for your kind words! I'm very excited to be in any way compared to R2D2, or as we lovingly refer to him, Artoo. He really was the brains of the Rebellion. I haven't yet decided what it means that my comment elicited all these movie references from you, but I'm taking them as compliments! 2Dye4 - That is how they were intended. After all it's a Disney blog post. deitydelaarithmetic - I really like the idea of buying the Crocs before hand. Seems like it would save you a lot of trouble during the trip. Are we going to get a top 10/bottom 10 list of WDW shops post anytime soon? The buying ahead thing came from realizing I could get them cheaper AND because you so kindly walked to ALL THREE All-Star Resorts with me Thanksgiving 2010 to help me find Crocs for LaRae & me. While that was a fun in-law bonding, see the places you don't normally see, experience, it wasn't really what my sore feet needed at that moment. As for best and worst shops, I'm not sure there are best and worst. I take that back, there are some blah ones in DHS, and there was a really neat one in DAK that I went in while Kyle looked for a shirt in June. Perhaps I could do my favorites and least favorites. I need to take pics of signage this trip to make the posts work best. It could be a series! Thanks for the idea! Walking to Three All Star resorts wasn't so bad. It's not like walking from to the bus stop to the boot. I guess you're right, it would be hard to rank them since so many of them have the same merchandise inside. But I think some have better themes than others. I like you're idea of pictures of the signs. I would read a blog post about that subject. There are some shops I always pass up because they're not that great, but then there's the Art of Disney stores that I can't get enough of and go in every one I see. The signs - I meant I'd take pics of the signs as I entered the shops and food places, but I could do a post about the signs bc they're all pretty darn cool. Signs are cool. I like Yield. For some reason, I'm always depressed by the really little gift shops right at the entrance to each park. Especially Hollywood Studios. It's like they are so close to the really cool stuff in the park, but they have to wait outside. Do you think that's how horses in the old west felt? Invest in a brita water bottle! You can refill it over and over and the water tastes great- not like the weird metallic taste Disney water fountains usually have. It will save you tons on drinks at Disney!